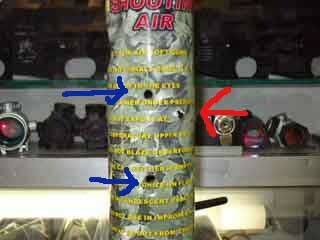 The blue arrows are point to "entry wounds". 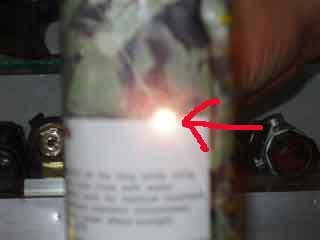 The red arrow is pointing at a "exit wound". Well, for those of you that want to play with high power guns, boy do we have one for you. Sun projects recently put out a CO2 powered M16 that has had some players talking for a few months now. When Peter, the owner of Power Edge inc, heard about this system he reminded us that there was CO2 gear box that has been used in Hong Kong for some time now. A few years back we had a converted Marui MP5A5. This gun was shooting so hard that it would shoot holes in the wooden bunkers on our CQB arena. No, it was never allowed in any of our CQB games. Because it's an internal upgrade you wouldn't be able to tell that it was any different from another AEG if it didn't have the hose sticking out the back of the gun. The gun came complete with the Hurricane HK logo M4 metal body installed. All we had to do was insert the battery, assemble the remote hose and attach the tank. Well, this gun did not disappoint. The first thing you'll notice when you fire it is how loud the muzzle blast is. It shoots hard enough where the gun does "kick" a bit and it makes full auto that much better! Due to the fact that it does not use a "heavy" spring to provide power for the BB, it only needs an 8.4 volt battery to function. The first thing we shot at was an old EMPTY green gas can. With a magazine full of .2 gram bb's, we had fun putting holes in the can. Peter insisted that we try shooting .36 bb's at the can. At point blank range, the bb's WENT THROUGH THE CAN!!! 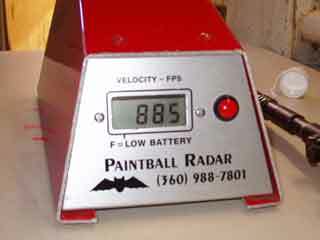 Chronograph showed results near 900 fps with a .2 gram bb. We did try putting a Laylax Mode 2 silencer on the front of the gun and it made a little difference on the noise but nothing really noticeable. Accuracy was about the same as a stock M4A1, but I suggest using heavier bb's for best results. The gun is still a Marui AEG so you can still use the standard accuracy upgrades like a KM or Prometheus barrel. Full auto is cool with this gun, about the same rate of fire as "real steel". Players that normally use high speed guns will have to get used to the slower rate of fire that this gun has. Coming from an "old school" paintball background, I do have some concerns with the CO2 "cooling off" while using full auto. I'm sure that the use of any standard paintball pressure regulator will help prevent any drop in performance. We did empty a full 9oz tank of gas while messing around in the store with it, but I'm not sure about how many shots you'll get from it (we were too busy having fun blowing things up). The light in the picture is shining from the exit point THROUGH the can. stock's tube and still allows for almost the full range of adjustment. It does seem to be the same easy mod to switch from collapsible to full stock if that is your preference. The CO2 M4A1 is very fun to shoot. Loud noise, hard kick, and decent accuracy makes it something that I wouldn't mind owning some day. Note: This gun does shoot VERY VERY HARD!!! We do not recommend that you use this in ANY games that you would be shooting at ANY person or animal. Please use common sense and be responsible when using this type of gun. It is a cool gun to shoot, but it does require more care to shoot than a normal airsoft gun because of the amount of noise it produces. 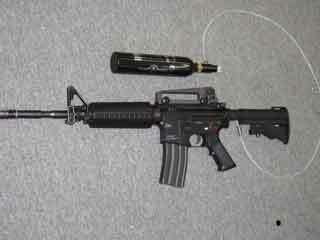 Your neighbors may be more inclined to call the local authorities when they hear this gun being fired in your backyard. 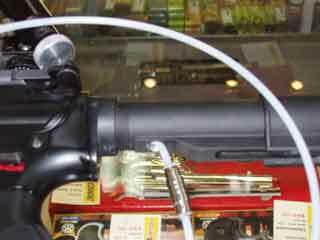 This gun is available from our retail store for $1500.00, but it is a special order item only. It will arrive in 2 - 3 weeks. For more info or to see it in action, come in to our retail store.